Skyros turns 40 this year. Measured by the standards of the alternative world, this is a very long time to be around, an achievement in itself of which, as one of its founders, I should be proud. As it happens, I am! I am prouder, however, of all Skyros has achieved. As many as twenty thousand people have joined it over the years and relished its unbridled spirit of adventure, creativity and joy. Many explored new possibilities, tried new ideas and unearthed amazing layers of themselves they did not even suspect they existed. In a world far removed from daily routines, others took the opportunity to reassess their life, redefine their needs and re-set their priorities. The unexamined life, as Socrates said, is not worth living. This broad and rather vague construct places Skyros beyond the reach of any definition. It is also what puzzles me when asked to explain what it is all about. How can you describe the soul of spring? Skyros is about living fully in the moment – and making the most of it. It is about the delight experienced by the appreciation of things for what they are – ‘a river for its riverness’, as Plato said – rather than their benefits in this life or the next, and the joy of living, if joy stands for something beyond the ‘fun’ offered to us by the entertainment industry. But Skyros is also the future. ‘Think’, I invite people when I am there, ‘what would really, really make you happy?’ The answer is not a Lamborghini, but a sense of purpose that is larger than one’s own self, a meaningful job that is socially validated, and a world, their world, in which they feel they belong and to which they can relate. What most people want is a simpler and more fulfilling life, their recognition as human beings rather than consumers or functionaries, and good, decent, loving relationships. In short, a life that makes sense. In this context, ‘more’ seems to mean something different from that which our materialistic, technocratic, consumer culture provides. Yet Skyros does not tell anyone what to do. It does, however, encourage people to get in touch with their gut feeling, question and challenge our culture’s assumptions and dauntlessly do what they need to do to lead a more fulfilling life. The process is underpinned by an ethos that emphasises being rather than having, doing rather than consuming and belonging rather than withdrawing into the ‘garden’ of your private world. Living such a life requires action in the pursuit of the right and the good in a way that expands the mind, nourishes the body, uplifts the spirit and helps the heart grow big. It demands an unappeasable love of beauty, from the beauty of the heart to the beauty of the institutions of a just society. Love is the informing God of all things. The goal is perfection through the development of personal human qualities relating to the whole of a man’s existence and not tradable against other goods such as wealth. It is pursued through, among other things, commitment to the community and to ethical living, both of which are indispensable to the happiness of the individual and the re-establishment of a high trust society, and cooperation rather than competition. It also requires responsibility rather than indifference, participation rather than non-engagement and respect for individuality. Fulfilling our potential affirms what is best in ourselves. It also asserts man’s power over his creations – the market, machines, technology, systems, fashion, ideologies or fundamentalist beliefs. Escaping the trappings of the ‘real’ world, in which genuine feelings are confined into the safe while on display are only their imitations, people are first and foremost asked to be themselves. This is the key to an authentic life. To be themselves, people have to cast aside habitual roles as a married partner, parent, boss, employee, official, client, club or union member or socialite, leave behind all features that make up their projected identity and re-connect with their own essence. This is what Skyros has been, and is still, trying to achieve in the spirit of creativity, camaraderie, risk-taking, self-discovery, tears, laughter, craziness and also a scintillating sense of humour. 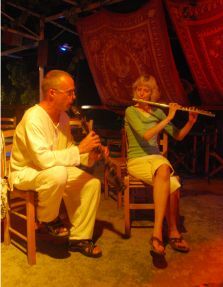 Skyros is unlike any other holiday – it is for anyone but not everyone! But if you want a taste of what life can be, if you are ready for a departure from tired old routines and are looking for inspiration to live the joy of your dreams, Skyros is the place to be. This is an erudite and elegant narrative, at times irreverent and provocative and at times romantic and lyrical – always well-informed. 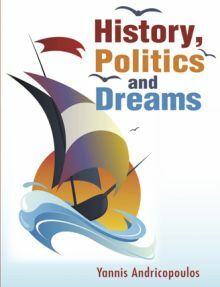 It provides a rich and colourful read, weaving together personal, political, cultural and historical threads. I opened it intending first to leaf through it and get an overview, but quickly found myself absorbed. I didn't pause until I was one third of the way through and Yannis Andricopoulos, by now the bemused if not reluctantly successful co-founder of the iconic Skyros Holidays, was meeting Margaret Thatcher and trying to negotiate the titular complications of the English language. For someone writing in a second language, Andricopoulos clearly has a gift – he moves effortlessly between the wry and the poetic. His candid reflections on his own struggles are endearing and he has a disarming almost unintentional way with bathos: "Luck had just deserted me as it deserted even its own temple in Alexandria, the temple of the goddess Tyche, which the Christians turned into a Tavern" Similarly he describes the way he and his ex-wife Dina Glouberman approached the project of setting up the internationally renowned holistic holiday company as "...the same way we could have booked a holiday in Tenerife" . Reading this book was a thought-provoking and entertaining journey for me.